Wet basements are a problem this time of year. If you don't work to prevent water and moisture from getting in, the bills for remediation escalate quickly. In this week's 'Issues of the Environment', Washtenaw County Water Resources Commissioner Evan Pratt offers up some tips for you. The American Society of Home Inspectors estimates 60 percent of U.S. homes have wet basements. 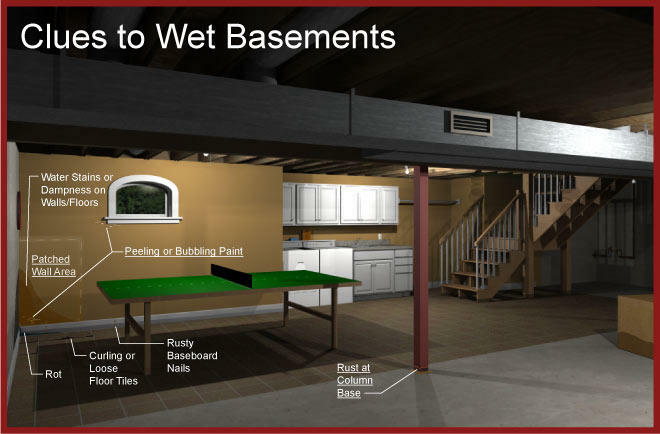 There are three main causes of wet basements: rain-related, humidity and subsurface seepage. This is the time of year when stormwater can be a problem, and the interview will focus mainly on rain-related issues. A 1-inch rain fall event will generate nearly 1,000 gallons of water from a typical 1,600 square foot roof. Keeping this water away from the home’s foundation is the number one way to improve a wet basement. Check to make sure gutters, downspouts and surrounding catch basins, or storm drains, are clean and draining efficiently. Regular cleaning or installing a product that prevents debris from getting into the trough may be all that is needed. Check to see if gutters are incorrectly sized for the roof area, or insufficient for the size of the house. Consider getting larger gutters, adding another downspout, or increasing the downspout size and its corresponding gutter opening. Check to make sure your downspouts are draining water far from the house. Experts suggest extensions of at least 10 feet to get the discharge away from the house (but also don’t send water into a neighbor’s yard!). Check to see that the yard is sloping away from the foundation. Check paved areas, driveways, and walkways that may be directing water toward the house. Proper slope has to be regained and may mean replacing pavement. But if it is lawn or garden and not pavement that needs regrading, it may be an easier fix, i.e. using a shovel to redistribute the soil to slope away from the house. Window wells and stairwells can collect water, causing leaks into the basement. For a window well, put a drain system underneath, cover it with a clear plastic cover and be sure the well has a raised-lip edge to repel water. For a stairwell, consider a raised-lip edge and a roof to cover the area. Just getting water moving away from your house isn’t enough—the goal is to then get it moving down, e.g. soak into the groundwater. If it doesn’t, it will simply become a problem for your neighbor’s house, and/or could rush into our waterways—too much, too fast—which can cause erosion and water pollution. So to avoid wet basements and water pollution, “slow the flow”! Minimize impervious surfaces such as concrete. Minimize turfgrass—Because the roots grow laterally and form tight mats, in a hard rain turfgrass sheds water more than it sends it down. Groundcover is more pervious than turfgrass. But best of all are long-rooted native flowers, shrubs and trees. Even clay soil is penetrated by hardy native species, which facilitates rain traveling down, moving vertically to the groundwater vs. horizontally to a basement or surface water body. Plant trees—According to the Arbor Day Foundation, a single tree may store 100 gallons or more. It is estimated that the urban forest can reduce annual runoff by 2 – 7 percent. Plant a raingarden—a raingarden need not be a huge or deep. Just be sure is lower than the level of the downspout it is collecting from, and is a bowl-like depression shaped to collect the rain vs. let it run off. As for minimum sizes, even a small rain garden or swale is better than none! Use species that tolerate moisture, which includes many common plants. Connect your downspout(s) to the raingarden via gutter extensions (which can be buried underground) or trenches filled with rocks. Washtenaw County provides free technical advise to residents about installing rain gardens. Currently, the County rain garden program intercepts some 2 million gallons of water each year. “We can’t promise to solve all wet basements, but if you give us a call, we can offer independent technical advice,” says Pratt. For more information on rain gardens, visit www.ewashtenaw.org/raingardens or contact Susan Bryan at bryans@ewashtenaw.org or (734) 222-3814. Groundwater is difficult to control. The ground surrounding a basement may become saturated with rainwater or an underground spring, especially if the soil is a heavy clay. Water pressure from saturated soil will push water through tiny cracks in the foundation. If groundwater levels rise above the basement floor, water will leak in. If the problem is small, a homeowner may try patching cracks from the inside. Interior crack repair does not prevent water from getting into the exterior section of the wall. Water trapped inside the basement wall can weaken the foundation. After pinpointing the source, a homeowner might dig down along the foundation to see if outer wall repairs are small or large before making a repair decision. Large cracks may require a structural engineer or basement specialist to fix any cracks, seal the outside, and install a drain around the perimeter of the house. A rain garden is one “tool in the toolbox” for fixing wet basements.